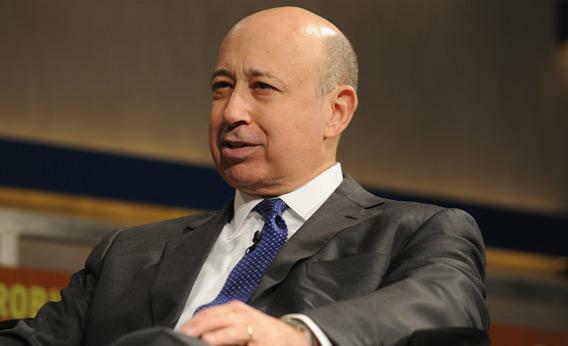 Lloyd Blankfein, vhairman and CEO of Goldman Sachs Group. Photo by Craig Barritt/Getty Images for the Robin Hood Foundation. Goldman Sachs CEO Lloyd Blankfein has an important op-ed in today’s Wall Street Journal. Perhaps because no traditional Wall Street banking CEOs were invited to the CEO confab at the White House today, he wanted publicize his views on some important fiscal issues. While I don’t agree with all of the points Blankfein makes, he does articulate a framework that permits a serious negotiation about fiscal issues to move forward. First, a disagreement. Blankfein asserts that uncertainty surrounding tax rates is a key reason why companies aren’t making capital expenditures, leaving a reservoir of more than $1 trillion of cash on the balance sheets of U.S. non-financial companies. While eliminating uncertainty would be great, the much larger issue is a lack of demand for the products that the capital expenditures would produce. We have a demand crisis, not an uncertainty crisis. Second, a point of partial agreement. Blankfein says, “I believe that tax increases, especially for the wealthiest, are appropriate, but only if they are joined by serious cuts in discretionary spending and entitlements. … Broadening the personal income tax base by closing loopholes will generate substantial additional revenue while minimizing increases in marginal rates that could stifle risk-taking and robust growth.” Without parsing the pieces there that I disagree with, it is important to note that he says “minimizing” increases in marginal rates, not “eliminating” or “refusing to agree to” increases in marginal rates. That is an important distinction. He is acknowledging that marginal rates will and should go up—something House Speaker John Boehner has refused thus far to agree with. What is lacking in Blankfein’s piece, not surprisingly, is detail. We all know the devil is in the details, and this is where it gets gnarly. So here is an offer: Let’s view this as open-source negotiating, as opposed to the closed dialogue taking place in Washington. Let Blankfein put on the table his first offer on the revenue side—a loophole closing or a marginal tax rate increase, with an expected revenue figure—and I will then match him dollar for dollar with a spending cut. We will proceed until we have the $4 trillion in deficit reductions over 10 years that are generally being sought. This way, we will see we what a genuine, detailed, balanced deficit-reduction package looks like. The details are tough, let’s give it a go and see if there is common ground.